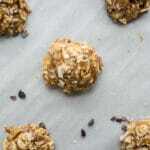 An easy no bake honey-sweetened snack loaded with nuts and seeds. Line a cookie sheet with parchment paper. In a large bowl, add honey, almond butter, and vanilla extract. Stir to combine. Add almonds, coconut flakes, sunflower and sesame seeds, and salt. Stir well until the nuts and seeds are evenly coated. Using a round tablespoon or small scoop, pack the tablespoon with some of the mixture and then carefully push it out the side and place on the cookie sheet. This should give you a rounded, dome-like shape. Spraying the inside of your tablespoon with a little cooking spray will help to smoothly remove the mixture. Alternatively, you can roll into a tight ball. Sprinkle honey almond bites with desired toppings and refrigerate for at least 2 hours. Store in the refrigerator in a airtight container. For storage: I layer the bites between parchment paper in an airtight container in the fridge.